There seems to be no end to the sinister assault on the person of Christ and the authenticity of the Christian faith. Forces that seek to undermine popular belief in the one true religion continue to proliferate. America’s historical affiliation with Christianity is being systematically purged from public life. And who is he who will harm you if you become followers of what is good? But even if you should suffer for righteousness’ sake, you are blessed. And do not be afraid of their threats, nor be troubled. But sanctify the Lord God in your hearts, and always be ready to give a defense to everyone who asks you a reason for the hope that is in you, with meekness and fear” (1 Peter 3:13-15, emp. added). First-century Christians were able and willing to give a reasonable defense for their belief in Christ as the Son of God. Are Christians in the 21st century able to do the same? Apologetics Press can help. In 2006, A.P. released the outstanding volume Behold! 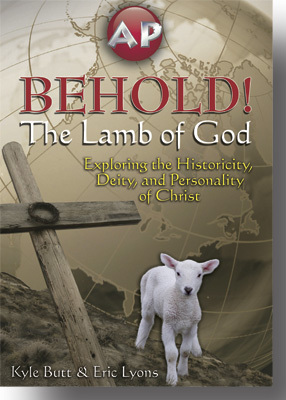 The Lamb of God to aid people in recognizing the Christ, by answering important questions: What prophecies did Christ fulfill? What miracles did He work? How is it that centuries before the time of Christ, stories were rehearsed among pagans of “crucified, resurrected, savior gods”? What makes Jesus different from everyone else in human history? Is He really all that different? Is the view of Christ presented in books like The Da Vinci Code accurate? Behold! 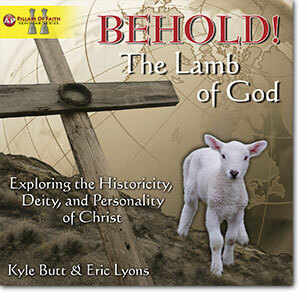 The Lamb of God presents a well-documented, persuasive case for the historicity, deity, and uniqueness of Jesus Christ. Indeed, this book accentuates Jesus Christ as the most outstanding, positive manifestation of God’s care that our lost and sinful world has ever known. The reader is brought forcefully face-to-face with the compelling question: What do you think of Christ? Purchased in bulk quantities for significant saving, this DVD is an excellent evangelistic tool that can be given to friends, neighbors, and acquaintances. Whether you’ve read the book or not, you will want to view these powerful presentations.